For over fifty years Trilby Animal Hospital has provided pet wellness care, including any need for pet surgery, for the animal companions of our Toledo community. Our experienced veterinarians, Dr. Alan Moore and Dr. Gina Lopez, work diligently to provide the services needed to keep pets safe, happy and healthy. 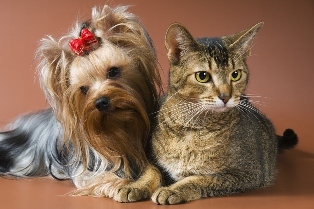 Perhaps one of the most important procedures we perform is the pet spay and neuter surgery. If you are not planning on breeding your pet, this procedure can eliminate the worry about unexpected pet pregnancies and play a part in controlling the dangerous pet overpopulation. Pet spay and neuter surgeries may also lead to a healthier life for your pet as they are helpful in reducing certain types of pet cancers, infections and other diseases which can affect their reproductive organs. Many pet owners also find that this pet surgery is helpful in reducing or eliminating certain unwanted pet behaviors such as yowling, marking territory, running away or aggressiveness. Our veterinarians recommend having these procedures performed early in your pet’s life as younger pets tend to tolerate the procedure quite well and this also increases the health benefits associated with it. If you and our veterinarian agree on having a pet spay and neuter surgery performed as part of a pet wellness care program, the steps we take are similar to any of the other surgeries at our animal hospital. Prior to the procedure we will conduct a pre-surgical examination to ensure that there are no other health conditions which may affect your pet’s capacity to tolerate the procedure. We may also recommend pre-surgical blood tests to assess the ability of your pet’s liver and kidneys to handle anesthesia. Pet spay and neuter surgery is performed in a sterile environment in our surgical suite. Our veterinarian will sedate your pet so that it will be asleep and not feel any pain. Our staff monitors your pet’s breathing and heart rate during the procedure. All pet surgery steps are taken to make the procedure as gentle, comfortable as possible to reduce pain and help increase your pet’s recovery rate. After the surgery your pet will be observed for any signs of pain or discomfort. Our veterinarian may recommend pet therapy laser treatment to reduce swelling, aid in pain management, and boost the immune response. When your pet returns home, you will be advised to watch for any excessive licking, restrict unnecessary activity, and to monitor food and water intake. If you should notice any unusual symptoms or reactions, please contact our animal hospital as quickly as possible so that our veterinarian can advise you on what steps need to be taken. Our Toledo veterinarians believe in gentle and compassionate treatment in all areas of pet wellness care. Spay and neuter surgery is a safe and effective part of pet healthcare. When you bring your pet to Trilby Animal Hospital for surgery, we treat your pet with love and respect.